The Retail industry is a consumer-driven industry and the recent global economic turmoil and marketplace forces have combined to create a challenging environment. Accelerating consumer trends are creating a greater urgency for retailers to address new marketplace realities. Future growth for retailers will come at increasing costs. Retailers will be increasingly constrained in their ability to grow and maintain profit margins as a result of high operating expenses, market saturation, the rise of multichannel buying, less affluent buyers, diminished consumer loyalty and the rise of digital media to influence purchase decisions. 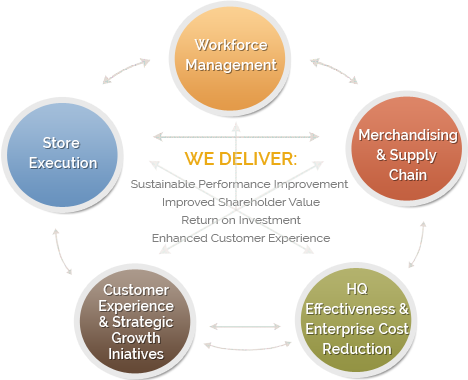 In order to remain competitive in today's changing world and ensure future success, retailers will need to ensure they remain focused on the long-term horizon and find innovative solutions to create value, fiercely reduce operating costs and mitigate risks throughout the entire enterprise. But whether you find yourself in survival or market share capture mode, the effects of these market forces can be harnessed or mitigated by capitalizing on financial and operational improvement opportunities that exist within your enterprise today. SNS Global Concepts knows how to help make a difference. We have successfully partnered with retailers of all segments, sizes, markets and scale to help them achieve superior performance in those critical areas that drive the retail business model and enhance the target customer experience. The cutting edge difference lies in our ability to harness our practical knowledge of the ground realities of the retail business and measurable solutions.